It’s National Christmas Jumper day, and we’re all sat in the office nice and cosy in our festive knitwear. Thousands of people across the country will be getting involved today, and we’ve seen some fantastic pictures on social media (our personal favourite has to be the woman with hundreds of baubles attached to her jumper – that is serious dedication!) but do you actually know the reason behind the fun? There are hundreds, if not thousands, of national awareness in the UK, from the most popular, such as Movember and Dry January, to the more unusual and random awareness days such as British Pie Week and National Kissing Day. The majority of the most well-known national awareness days are created by charities, in the hope to raise awareness of their cause and vital funds. But as some national awareness days quickly grow in popularity, lots of people jump on the bandwagon and the meaning behind them can be lost. Did you know that National Christmas Jumper Day is in aid of Save the Children? Unsurprisingly, some people in the office didn’t know. The UK based charity is encouraging everyone to get involved and donate £2, to help give children a healthy start and protection from harm. For charities to get the most out of awareness days it is crucial that they get the messaging spot on, otherwise the meaning behind the event gets lost or hijacked by another cause or brand, or can quickly become just a bit of light-hearted, social media fun. 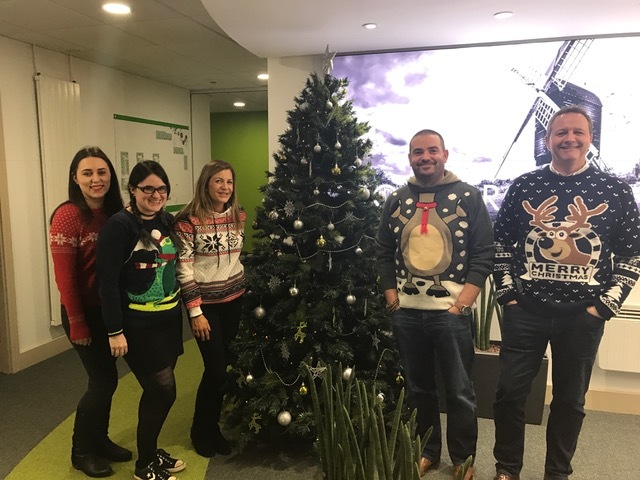 We’ve loved seeing everyone’s pictures of Christmas jumpers today, and we hope you’ve all remembered to donate!